Specific features of the "normal" Newfoundland and Labrador climate can be either positive (beneficial), or negative (cause difficulties). (1) Potentially damaging or life-threatening thunderstorms, accompanied by frequent lightning, hail, torrential rain, severe wind gusts and possibly tornadoes occur very infrequently over interior sections of the island and Labrador. Together with the low population density, this means a low risk or probability of injury or death, or significant costly damages, arising from such storms. (2) Over southern and southeastern Newfoundland winters are relatively mild (prolonged low temperatures < -15°C are rare) and of shorter duration compared with northern parts of the island and Labrador. This means reduced indoor heating demand, and lower fuel or power costs for domestic, commercial and industrial users, a significant proportion of whom are located in southeastern Newfoundland. (1) From late fall through early spring, a high frequency of temperature fluctuations above and below 0°C (freeze-thaw cycles) is characteristic of southern and southeastern parts of the island. Such temperature oscillations are often accompanied by precipitation changing between frozen and liquid forms. As a result, road surfaces deteriorate due to repeated expansion and contraction in the presence of water or ice. Repairs are needed more often than would be the case under a more stable and drier winter climate. Similar problems may affect building walls and roofing materials, if not properly designed, selected or maintained. 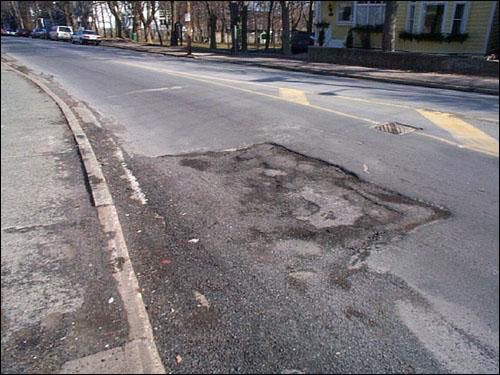 Potholes are a common sight on Newfoundland roads and streets, despite repeated efforts by maintenance crews to repair them. Reproduced by permission of the Newfoundland and Labrador Heritage Web Site Project. © 2000. 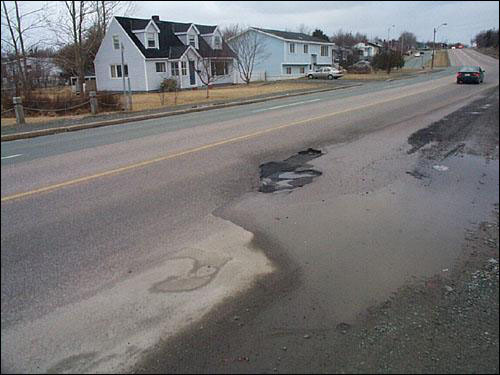 Another example of a pothole on Newfoundland roads and streets, despite repeated efforts by maintenance crews to repair them. (2) Storm force winds (sustained velocity above 70 km/hr, with gusts well over 100 km/hr) accompany the most intense cyclones that pass over or near the island and southeastern Labrador numerous times each year, especially in winter. Such winds constitute a potential hazard to highway traffic, particularly if road surface conditions and visibility are also impaired. Valleys cut through the Long Range Mountains funnelling violent, gusty winds capable of overturning transport trucks. Reproduced by permission of Geological Survey of Canada, Natural Resources Canada. ©1987. 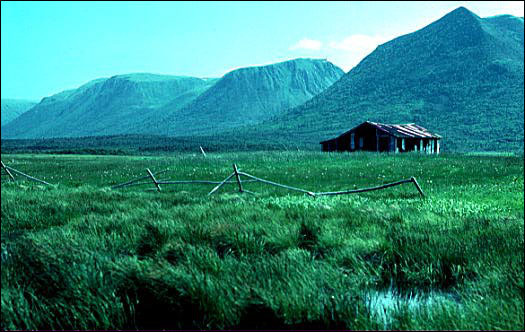 Velocities may be further strengthened by the local terrain, as in the case of the well-known southeasterly downslope winds at Wreckhouse, near the Codroy Valley, which have caused many accidents and delays over the years. Such potential highway hazards require suitable warning procedures to be in place. 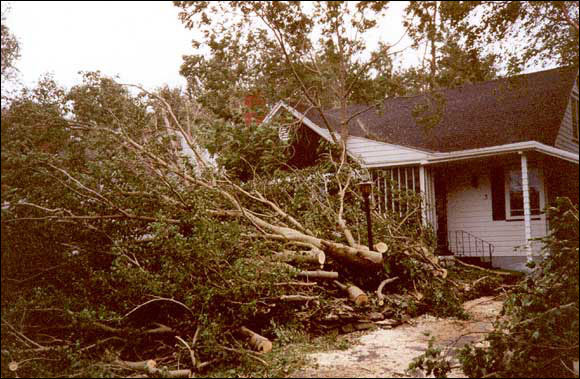 There is also a risk of property damage from trees uprooted or snapped by severe winds, as was the case at St. John's on October 6-7th, 1992; in this case a combination of saturated soils and heavy fall foliage on deciduous trees contributed to the damage. Reproduced by permission of Carole Anne Coffey. ©1992. In addition, marine transportation is occasionally hindered by the combination of high winds and sea state, particularly during the precise manoeuvring required near a dock. Ferry schedules requiring short turnaround intervals are especially vulnerable to the most inclement wind and sea state conditions, which are most probable during the period from November though March. (3) During periods of freezing rain or drizzle in winter and early spring, the accumulation of clear glaze ice (ice accretion) on exposed surfaces can result in difficult or hazardous driving and walking conditions, interruptions to electrical power supply due to icing of transmission system components, and the need to de-ice aircraft at terminals. Ice accretion is often referred to colloquially as "glitter", "glaze" or "silver thaw". Reproduced by permission of Ben Hansen. From Ben Hansen, Newfoundland Gems (St. John's, NL: Vinland Press, ©1996). Ice accretion is most frequent over eastern coastal sections of the island, where the average annual duration is at least four times as great as over western Newfoundland and in Labrador. In most years the individual occurrences are fairly brief (3-8 hours), with the amount of ice build-up creating only temporary inconvenience, relatively few instances of personal accident and injury and limited power failures. Much more serious consequences arise from prolonged episodes of freezing precipitation. Newfoundland Hydro sub-station, Mt. Scio Rd., St. John's, NL, spring 1995. 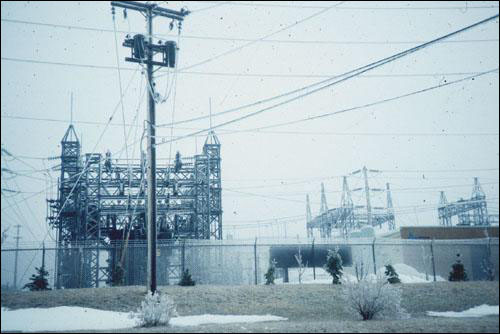 A buildup of clear ice ("glaze") on power grid sub-station components occurs following several hours of rain and/or drizzle with air temperatures just below 0°C. in the near-surface air layer, causing the droplets to freeze on impact. 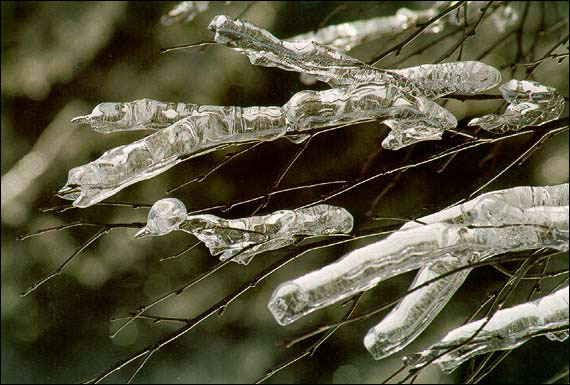 Accretion will grow faster in freezing rain than in drizzle owing to larger droplet size. This may lead to failure of conductors or transmission lines if the situation persists over a lengthy period and is not immediately followed by thawing, especially if wind speeds are high which would place more load strain on the equipment. Reproduced by permission of Colin Banfield. ©1995. (4) Periods of heavy windblown snow (blizzards) pose a threat to personal safety outdoors and on isolated highways, during situations involving extended, inadequately protected human exposure to such conditions, especially when accompanied by air temperatures well below freezing. Restrictions on movement increase the risk of frostbite and hypothermia. Blizzards may occur in any part of the province from late fall through early spring, though the probability is relatively high, on average, over topographically exposed parts of the northeast and west coasts of the island and coastal Labrador.